Sierra McCormick was born on October 28, 1997, in Asheville, North Carolina. Shortly after her birth, the family moved to Los Angeles. 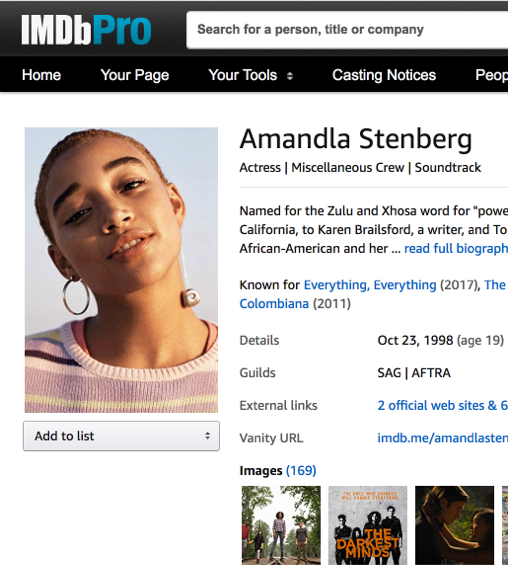 Soon, Sierra developed a keen interest in acting and joined 'The Corsa Agency' in Los Angeles. Growing up, she was very close to her mother. She considers her parents as her biggest support system. She has a younger sister, Kayla, and has been very fond of her since childhood.Her first few auditions were not too great, and this led to her getting disheartened. However, the strong spirit she possessed had her going, and she ended up playing a guest appearance in the series 'Til Death (2006) at the age of 9. She was not credited for the role, but it provided her significant experience in front of the camera. After a brief uncredited stint with a TV show, Sierra kept auditioning for better and bigger roles. She aced the audition for the popular game show Are You Smarter Than a 5th Grader? (2007) which had thousands of other participants from across the country auditioning for it. She appeared on the second season of the show and was introduced to wider fame. In 2007, she bagged a role in the comedy series Curb Your Enthusiasm (2000). She appeared as 'Emma' in three episodes of the series, which was one of the most popular comedy series of the 2000s. In 2008, she played guest roles in Boston Legal (2004) and Supernatural (2005). In the former, she had an episode-long role, while in the latter, she appeared in two episodes, as 'Lilith.' In 2009, she made her film debut with a small role in the adventure comedy Land of the Lost (2009). In 2009, she lent her voice to the made-for-television film Jack and Janet Save the Planet (2009) and followed it up with small guest roles in a number of series such as Monk (2002) and Criminal Minds (2005). However, her stint in the episode Hannah Montana: Welcome to the Bungle (2009) of the popular program Hannah Montana (2006) caught the attention of 'Disney.' In 2010, she played a significant role in family comedy-drama film Ramona and Beezus (2010) which starred Selena Gomez. She then appeared in another family comedy A Nanny for Christmas (2010). She played 'Kara Bannister' in the 2009 TV film The Dog Who Saved Christmas (2009). In 2010, she appeared in two small roles in the series CSI: Crime Scene Investigation (2000) and Medium (2005). This was followed by a short-lived series Romantically Challenged (2010) which saw her playing 'Scout Thomas.' The series ran only for five episodes, before being canceled. This was one of the most significant roles of her career, and the series getting canceled was a big blow for Sierra. In 2011, she began her association with 'Disney,' with their comedy film Spooky Buddies (2011). It was one of the many installments of the 'Disney Buddies' franchise, which was a straight-to-DVD film series. Sierra played 'Alice,' one of the leading characters, and received immense appreciation for her performance. She was invited to audition for a main role in the Disney sitcom A.N.T. Farm (2011) in 2011. The audition was for the role of 'Olive Doyle,' a therapist. During the audition, the producers did not give her any scene to play. They made her talk about tigers instead. Sierra seemed perfect for the role and was selected. The series premiered on May 6, 2011, and Sierra portrayed the role of a girl with a strong memory and a lot of phobias. Her role in the series was loved by all, and the pilot garnered 4.4 million viewers on the day of its release. The sitcom performed successfully on 'Disney Channel' and turned Sierra into a well-known face in the American entertainment sphere. In 2011, she was seen playing 'Connie' in the series Jessie (2011) . She was then offered to play a pivotal role in 2015 horror film Some Kind of Hate (2015) which was received well at the film festivals. Sierras significant roles received accolades at the 'Fantasia International Film Festival' and at the 'Stanley Film Festival.' In 2017, she portrayed the role of 'Kara Gentry' in the TV film Christmas in the Heartland (2017). She also appeared in a music video for the 2011 song 'Dynamite' by China Anne McClain.